Dow Kokam and PVI have announced an agreement to supply advanced lithium polymer battery systems to power the first ever fully electric refuse trucks. The electric truck and its battery system, which will be produced and assembled in France, were unveiled at Pollutec 2010 by PVI and its partner SITA, a subsidiary of Suez Environnement, alongside examples of Dow Kokam's battery system technology. The 26-ton, zero-emission truck will eliminate 130 tons of CO2 per truck per year. "The unveiling of our first fully electric refuse truck, arguably the largest electric truck on the market, is a great accomplishment in vehicle electrification because these trucks place unique and high demands on their operating systems due to specific designs for urban cleaning," said Michel Bouton, the Chief Executive Officer of PVI. "The ability to introduce a completely electric truck of this size that doesn't sacrifice performance or power is due to PVI's extensive history in vehicle electrification and the selection of Dow Kokam's advanced lithium polymer battery system technology, which provides ready solutions to meet the high performance needs of working trucks operating daily in urban environments." 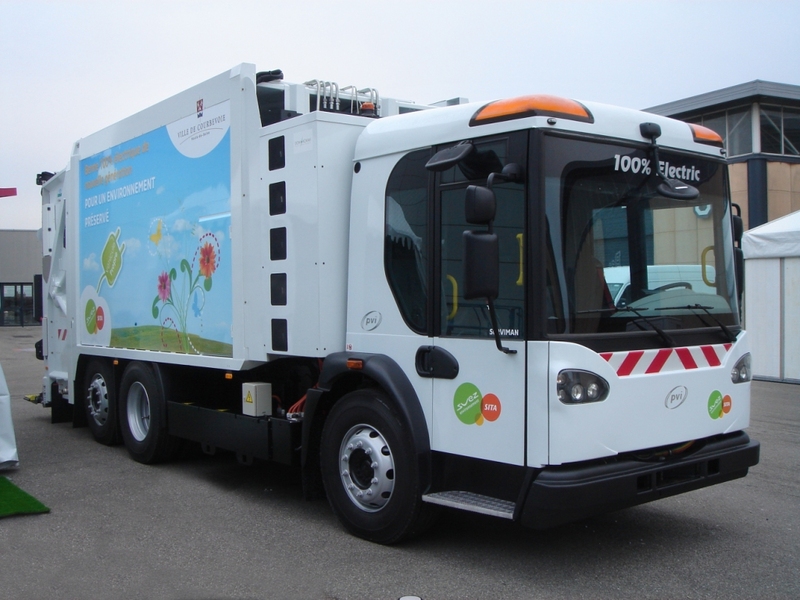 Electrification of all powertrain elements of the trucks and the mechanical elements for collecting refuse bins allow for significantly reduced noise pollution, zero local emissions and no idling during inactive periods. PVI designed the vehicles to achieve comparable performance to conventional refuse trucks with a maximum speed of 70 kilometers per hour at full payload, and the added benefit of 100 percent starting torque. Drivers will be able to collect a payload of 16 tons in two rounds of service. The modular plug-in battery pack was also designed to be interchangeable or accommodate a partial recharge between two daily service rounds, thus doubling performance capabilities. Thanks to PVI's integrated gearbox kinematics, the truck will be able to climb steep inclines with a full payload without impeding urban traffic. Dow Kokam will supply each truck with a complete battery system containing five strings of seven battery packs (equivalent to 250 kilowatt hours), power management capability and the complete battery management system. In accordance with Dow Kokam's announcement on May 26, the battery systems are assembled in France at the production facility of Le Bouchet (Vert-le-Petit, Essonne). PVI selected Dow Kokam's large-format, flat-cell battery system because of its 10 year usable life and superior energy density - 140 watt hours per kilogram of specific energy. The advanced liquid cooled lithium ion battery packs and exceptional thermal management of the Dow Kokam system extend the system's lifetime, and enable the vehicles to be used in very diverse operating temperatures from the far northern areas of Europe to the very south. Dow Kokam batteries bring the reliability of more than 10 years of proven performance in demanding applications. The system integration capabilities have been proven in more than 1 million kilometers of rigorous, on-the-road testing. Dow Kokam technology has been adopted as the primary source of energy for high performance equipment in industries ranging from transportation, marine, aerospace, defense and high-end industrial products. "This achievement demonstrates that real advanced battery solutions exist for the commercial and fleet industry today," said Jean-Francois Herchin, Vice President of Dow Kokam. "PVI has chosen Dow Kokam technology to achieve the highest level of usable energy while maintaining the power and acceleration necessary to move its massive 26-ton truck." PVI's vehicle, propelled by Dow Kokam battery technology, is the first ever fully electric refuse truck offering the same performance levels as conventional utility vehicles. Its first deployment by SITA Ile de France is expected to be in Courbevoie, just outside of Paris, by early 2011; and a fleet of 11 vehicles will be operating daily before the end of 2011.